I think I will go a little different on this one. 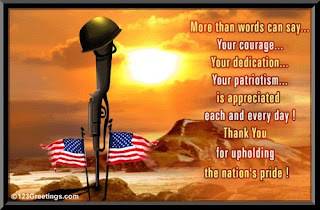 It's Veteran's Day and we all need to thank a Veteran. My family is full of American soldiers and that makes me proud. My daddy was in the Army and fought in the Korean War. He doesn't talk about it much and we don't have many pictures because that was many years ago. But let me just say right here, this taking a knee crap doesn't set well with him. Wait, what am I talking about, it doesn't set well with me either. The American soldier to me is way beyond anything I can comprehend. They're always on duty, can't call in sick on Mondays and they work straight through the holidays. He wants to be a good husband and father and meet the needs of everyone else. He's not a soldier for the money because he's still unable to pay all the bills and the glory isn't a good reason because it's not always glorious. Toby Keith says The American soldier is a soldier because he has to fight for the future of his family and his country. He is aware of the risks of being a soldier and he claims he doesn't want to die for his country but if that happens he will "bear that cross with honor" because he understands the cost for the freedom we enjoy in our country. He will fight for freedom and liberty, and if that's jeopardized then he will take a stand because that's WHY he is an American soldier. Lesson today? I said it in my opening statement. Thank a Veteran today! Thank him for the sleepless nights and missed holidays away from HIS family to protect YOUR family. Thank him for the endless hours of being on duty to protect our great country. Heck let's go a step further and thank their spouse too because while HER American soldier is away protecting us, she's home protecting her family without her American soldier.